After three successful tournaments, the Ante Up for Africa poker tournament has become as much of a staple at the World Series of Poker as the ladies only championship, casino employees tournament or seniors tournament. The 2010 version will once again feature a star-studded lineup of poker pros, professional athletes, and Hollywood celebrities. Among those who have already agreed to participate in the charity tournament that raises funds to the help the people of Darfur as they deal with dictatorship and genocide are poker pros Annie Duke –a co-founder of the Ante Up for Africa event, Duke’s brother Howard Lederer, Chris “Jesus” Ferguson, Phil Gordon, Andy Bloch and Erik Seidel. In addition to these players, Phil Hellmuth has signed on to be the official Master of Ceremonies for the tournament. 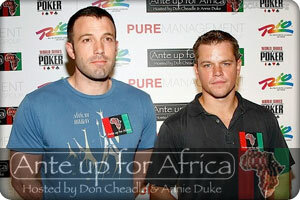 Hollywood will also be well represented by poker enthusiasts Ben Affleck, Matt Damon –whose role as Mike McDermott in Rounders helped kick off the current poker boom–, Ray Romano, Brad Garrett, Sarah Rue and co-founder Don Cheadle. Athletes have also been a staple in the event and thus far Tracy McGrady has signed up for the tournament. Obviously as the event draws near –the Ante Up for Africa tournament is scheduled for July 3rd at the WSOP – more big names will be announced. This entry was posted on Saturday, May 22nd, 2010 at 3:22 pm and is filed under Poker News. You can follow any responses to this entry through the RSS 2.0 feed. You can leave a response, or trackback from your own site.